The poem anthropomorphizes daffodils in a beautiful way. Wordsworth writes in first person but refers to them as “a crowd” in third person. He sees them “Beside the lake, beneath the trees,/Fluttering and dancing in the trees.” There is something brilliant in the imagery of referring to a collection of daffodils as “a crowd” that all toss “their heads in springhtly dance” and rejoice “in glee.” In the second part of the poem, Wordsworth transports the reader from the meadow to a couch and points out that the daffodils are so magnificent that “the dances with the daffodils” fill his heart with pleasure whenever he is in a “vacant” or “pensive mood” and they happen to “flash upon that inward eye.” I remember reading this poem long ago, perhaps in a high school English class, and it is a great example of Romantic poetry. 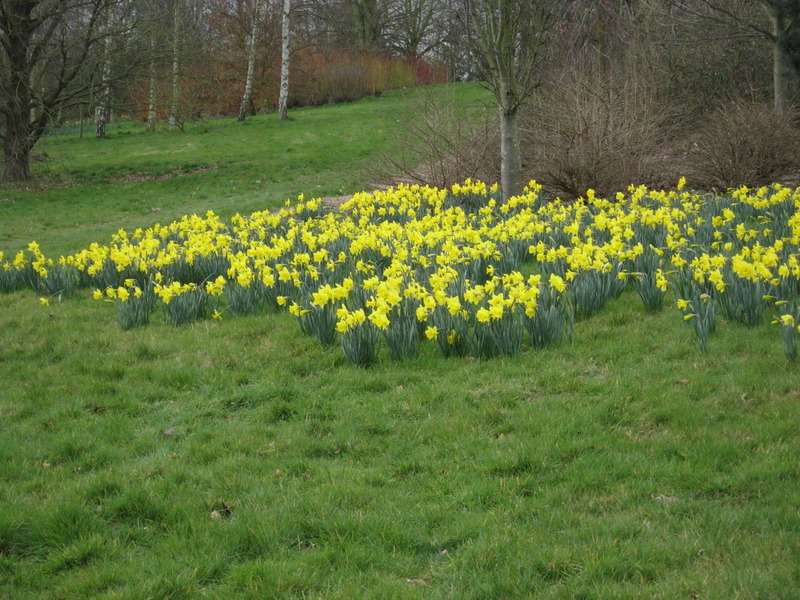 Wordsworth’s imagery and word choice is so effective in conveying the beauty of those daffodils that the poem actually captures the flowers better than any photograph possibly could. This poem seems to be a continuation of the previous poem, ‘To a Butterfly.’ It is also about Wordsworth and his sister Emmeline’s childhood and their examination of a sparrow’s nest. The nest, simple yet elegant, holds “five blue eggs.” It is touching that Wordsworth sees him and his sister’s viewing of the nest as visiting “the sparrow’s dwelling.” There is again a comparison between how Emmeline and he each respond to the nest. “Such heart was in her” that “she looked at it as if she feared it.” Wordsworth admits that he did not see her approach to the nest as a magnificent thing until his later years and that it took a lot of time for him to appreciate beauty and love in the way that Emmeline seemed to so naturally. As a result, he credits her for giving him his eyes, ears, humble cares, and delicate fears as well as “A heart, the fountain of sweet tears,/And love, and thought, and joy.” To me, it seems unlikely that Wordsworth did not have these things when he was young but simply came upon them later in life since the realization and the credit he gives Emmeline would not be possible otherwise. The poem that follows is written in first person, from the perspective of that “Forsaken Indian Woman.” This woman says, “Before I see another day, Oh let my body die away!” She begs to die before the coming of the next day because her “fire is dead-it knew no pain; Yet is it dead, and I remain.” In other words, the woman has no desire to live anymore and yet her body continues to exist. In the middle of the poem, the woman grieves for her child who has been given to another but she knows that death will soon relieve her of her pain. The man is so demure that even the little birds along the road do not pay attention to him. His movements, starting from his face to his walk and gait, are one and the same. The old man moves like a man lost in thought. This man, one who is lost in thought, is “subdued to settled quiet.” This can be interpreted to mean that the man has a kind of quiet confidence about him. “He is one by whom all effort seems forgotten” means that the man appears effortless in his movements. Furthermore, while for others “long patience” requires strength and determination, this man has no need for it since he is naturally at peace. The old man’s peaceful presence is “so perfect” that even the young are jealous of it, even though “the old man hardly feels” it.